This shift began three days ago and continues through October 7th. We have Saturn/Moon influence in play wrecking havoc for some, being overly emotional with outburst of crying, bringing karmic return for others, and for more bringing higher lessons learned to the conscious from the subconscious. Others see magical manifestations from their intentions, while others experience Divine protection. 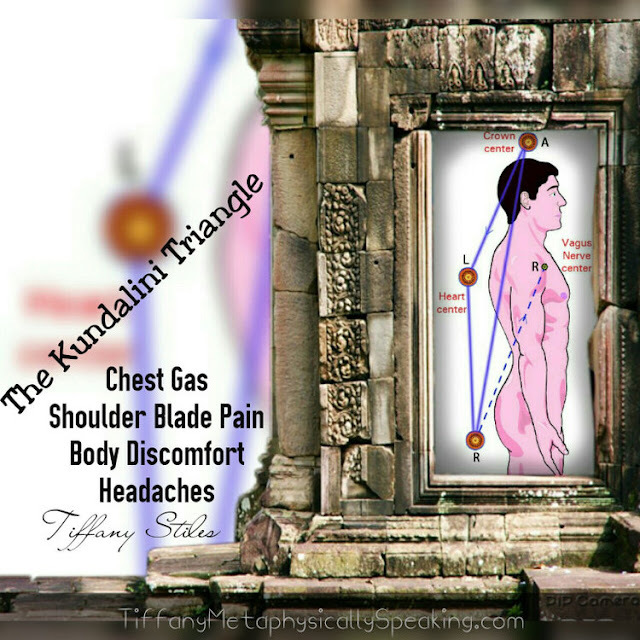 This astrologically lined influence triggers the Triangle Kundalini Effect! This brings gastro-intestial discomfort, heartburn, excess gas in the chest cavity, pain between the shoulder blades, lower back pain and headaches. Be sure to remain grounded with Earth through this shift to alleviate symptoms. Symptoms should begin to ease up as we progress towards October 7th. Saturn is a spiritual teacher. Jupiter is expansion to Saturn’s power of contractions. They are the first of the spiritual planets, or the upper octaves of the personal planets. Saturn is considered the upper octave of the Moon, both tied together through the concept of karma. The symbol of Saturn is a cross on top of a crescent Moon. Which we currently have at this time. Spiritually, Saturn is associated with both the root chakra and the crown. As the ruler of the root, Saturn relates the earth element, the physical world and all the trials and limitations that come with being in the world. As the ruler of the crown, Saturn represents the resolution of karma, and the move into higher consciousness. Saturn is the teacher, but unlike Jupiter, it is a taskmaster teacher. Saturn is like the small still voice within. When you listen to it, everything is fine. When you don’t, Saturn manifests whatever you are ignoring in your life, usually as a challenge that you are forced to face. The metal of Saturn is traditionally lead, because it represents the weight of the responsibilities we carry. Magically, Saturn is the power of manifestation. It brings things into form, both our karma and our intentions, if they match our spiritual path. Saturn is the master of discipline, named after the Roman version of the Greek Chronos, the Titan associated with the harvest and reaping both rewards and consequences. Saturn is often like our Father Time and Grim Reaper archetype mixed into one. In the Kabalah, Saturn is associated with the sephiroth of Binah, and linked to the divine feminine, cosmic goddess and destroyer. Saturn is the power of the primal and ancient ones in any culture – the first gods, the Ancient Father and Mother. The sign of Saturn is the earth sign Capricorn, the mountain goat, and because the Sun enters the sign of Capricorn at the Winter Solstice, a time traditionally associated with the birth of the divine child in many cultures, Saturn is also linked with the divine child of life and rebirth. Saturn has many divine faces. It matters not which one we listen to, as long as we listen to that small voice of guidance before it becomes the landslide. Saturn can be called upon for magic involving protection, since it binds and limits. Use it to bind and limit any harmful energy directed to you. It is not the power of the warrior’s protection, such as Mars. It is the power to simply neutralize, inhibit and banish harm. If harmful energy is like a bullet, Mars protection dodges, deflects and counterattacks. Saturn simply robs the bullet of momentum, grounding it. Saturn can be called upon in ritual to make your karmic “lessons” more clear to you, to understand the repercussions of your actions. Saturn rituals are great for understanding what is occurring in your life, and why. The sephiroth of Binah translates to understanding. Call on Saturn to understand your current challenges. Use this planet’s energy when you have chaos in your life, to bring order and structure. Use it to gain discipline to complete a goal or maintain a program. I’ve used Saturn’s energy to keep on exercise and diet routines, when needing discipline. The power of Saturn is well known in the eastern yogic and martial art traditions. Saturn can be used in any spell requiring a manifestation on the physical plane, in particular this energy resonates with some prosperity magic, if you have earned the boon through hard work and responsibility, and for magic involving getting promotions, climbing a social or corporate structure, using authority and wielding power. Keep in mind Saturn also reminds us of the repercussions of all our actions, so in keeping with the Wiccan Rede and other magical axioms, “do what you will and let it harm none.” Saturn will teach you responsibility if you do not use its powers responsibly. Kundalini awakenings affect your physical, emotional, mental and spiritual state and well-being. As kundalini energy rises, you may undergo bouts of anxiety, depression, weight changes, migraines, nausea, palpitations and out-of-body experiences. Gastric disorders are also common during various stages of kundalini activity, and constipation, diarrhea, excessive gas, bloating and irritable bowel syndrome are some of the symptoms and conditions that can manifest. The solar plexus, the third lower chakra, distributes energy throughout the body. This chakra governs the ego and has an effect on your emotional and mental state. It also controls the digestive system, which is why gastric disorders may develop when the solar plexus is energetically weak or blocked. Kundalini Teacher highlighted the issue of gastric disorders and kundalini awakenings, saying that problems can occur as a result of the kundalini energy clearing and purifying the solar plexus. It lists food sensitivities, diarrhea, gas, loss of appetite and cravings as common symptoms. Disorders occur as a result of the redirection of energy and enzymes from the solar plexus during the kundalini transformative process. The immune system is compromised during kundalini awakenings, which in turn affects the digestive system, depriving it of energy it needs to properly function. Candida is a disorder that can develop when the immune system is weak, according to Biology of Kundalini, raising the risk of other conditions such as leaky gut and irritable bowel syndrome. Your body’s pH balance and electromagnetic field adjust during the kundalini awakening process, which interferes with the balance of friendly bacteria. Biology of Kundalini suggests you gradually introduce raw liquidized foods into your diet to counteract gastric disorders. Juices, soups, wheatgrass and green smoothies are easy to digest, unlike solid fibrous vegetables and high-antioxidant fruits, which it recommends you avoid. Toxic-laden sugary foods, alcohol and caffeine should be eliminated to prevent overtaxing the digestive system. Kundalini Teacher considers it more beneficial to eat foods that agree with your individual digestive system and nutritional needs. The reason for this is that food sensitivities sometimes develop during kundalini activations, causing you to experience adverse reactions to foods you normally eat, while triggering new cravings. In such cases, it suggests you give in to your cravings, as they may be kundalini’s way of guiding you toward your body’s nutritional needs. Kundalini Teacher also strongly advises seeking the help of a naturopath during the process of purification for kinesiology allergy testing. Although the kundalini awakening may interfere with your bodily functions, symptoms are usually temporary. Seek medical advice if symptoms last for a prolonged period. Love, Light and Kundalini Triangle Effect Blessings. This shift will bring you into your higher self, karmic debt cleared, life lessons learned, magical manifestations, clarity brought from subconscious to the conscious, increased vibrational frequency, collapsing past life timelines and shifting timelines. Hold onto your Kundalini, here we go! !